Open Door Preschool has been welcoming and engaging children in Northfield, Minnesota since 1966. Our classes for children 3-6 years old are based on a 2-day, 3-day or 5-day schedule and can be combined to meet the needs of busy families. Open Door focuses on the social, emotional, physical and educational needs of each child. We recognize every child as an individual and attempt to foster unique and creative attributes through a variety of play-based learning experiences. Our goal is to build positive self-images and enable each child to shine! Open Door works in partnership with the Biology Department at St Olaf College. 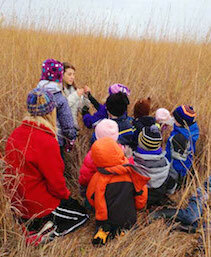 Children from Open Door visit the St Olaf Prairie/wetlands three times a year to observe the seasonal changes under the guidance of selected students from the Biology Department. In addition to the prairie/wetland experience, the St Olaf students bring environmental activities and visual aids to the Open Door classroom on a monthly basis. This is an innovative, exciting program which helps develop and promote environmental awareness. Beginning in 2013 Open Door has been partnering with the Center for Community and Civic Engagement at Carleton College. We visit the Carleton Weitz Center for Arts annually where the children are exposed to art, movement and dance opportunities. Open Door is able to offer two types of scholarships. One, through our Parent Aware certification allows for up to $7500 to eligible families. The other, offered through Open Door, allows for up to ¼ scholarship based on need for those who do not meet the Parent Aware eligibility. Please visit our scholarship page for more information. COME JOIN US! Registration is now being accepted for the 2019-2020 school year and the current year. For more information contact our director, Barb Howe at 507-645-8532 x1 or email barb@opendoorpreschoolnorthfield.org.